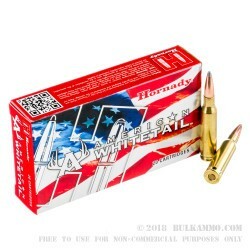 Another classic American deer hunting ammunition with a great set of features and ballistics from the American Whitetail line by Hornady. The well-known 7mm-08 cartridge is a round that hunters have been stuck to since its inception and it delivers the right kind of performance for dedicated deer hunters. The 139 grain Interlock Soft Point projectile offers more than enough to take deer of all sizes and can be tuned to half minute of angle accuracy if needed. A great mix of speed and power from a mid-range cartridge, this load gets 2840 feet per second velocity at the bore and 2480 ft. lbs. of energy. 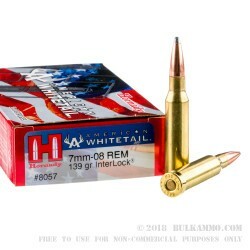 With the known performance of the Hornady American Whitetail line and the premium component selection this represents quite a value for the 7mm-08 round. The Interlock ring technology ensures reliable core to jacket inclusion and reduces weight loss on impact for the projectile. With more weight retention, the range of versatility for different game goes up for this cartridge. 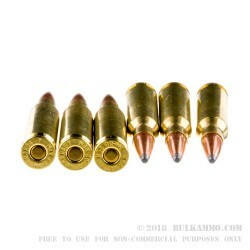 A brass cartridge casing and a Boxer primer makes this round reloadable, enhancing value at purchase for those who like to mess with handloads for the caliber. 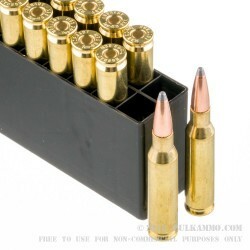 This load is suitable for use in all 7mm-08 firearms, but should not be confused with other 7mm rounds.